Jomari Yllana comes from a five-generation family whose history is closely associated with Our Lady of Peñafrancia. The actor stars in the family drama Ikaw ang Pag-ibig, which will open in cinemas starting February 23. 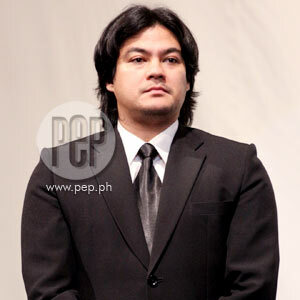 Jomari Yllana plays the lover of Ina Feleo's character in the family drama Ikaw ang Pag-ibig. Originally titled Peñafrancia, this movie is considered to be the comeback film of Direk Marilou Diaz-Abaya who took a break from directing after being diagnosed with breast cancer in 2007. The January 10 screening of Ikaw ang Pag-ibig was supported by presidential sisters Ballsy Aquino-Cruz and Viel Aquino-Dee. The Dolphy Theater in ABS-CBN was filled with members of the clergy, led by the Archbishop of Caceres, Most Rev. Leonardo Legaspi. National Artist for Literature Bienvenido Lumbera and National Artist for Film Eddie Romero were also guests of honor during the event. Aside from Jomari and Ina, the other stars of the movie present last Monday night were Marvin Agustin and child actor Yogo Singh. Guests included director Laurice Guillen and her daughter Ana Feleo (sister of Ina), Rap Fernandez, as well as siblings Bodie and Djanin Cruz. Rocker-turned-actor Marc Abaya also took the time to attend the red-carpet event to show his support for his mother, Direk Marilou. Produced by the Archidocese of Caceres and the Marilou Diaz-Abaya Film Institute and Arts Center, Ikaw ang Pag-ibig is graded "A" by the Cinema Evaluation Board. It is also endorsed by the Catholic Bishops' Conference of the Philippines. Star Cinema is the distributor of this movie, which will open in cinemas starting February 23, 2011. It will be shown in various schools and universities starting February 9. Ikaw ang Pag-ibig was first offered to celebrity couple Ryan Agoncillo and Judy Ann Santos. However, Direk Marilou decided to tap Jomari and Ina as the lead stars of the film when Juday got pregnant. When asked how he felt about being the final choice for the role, Jomari pointed out, "Parang isang umaga, nagising ka at may in-offer sa 'yo na project na hindi mo mahindian. Sa 'kin, para siyang task na hinarap at sa iyo. Hindi puwedeng kalahati lang ang gagawin mo, dapat wholeheartedly. Dapat complete devotion." CONTINUING THE LEGACY. In her speech before the screening of the film, Direk Marilou introduced Jomari by saying, "Jomari comes from a five-generation family of priests and clergy. His great-great grandmother, Tiya Maria, was the only one allowed to dress up the Virgin. His uncle is a friend of mine, he is the papal nuncio formerly of Pakistan and now of the Congo. Jomari is still secular till now." Jomari revealed to PEP (Philippine Entertainment Portal) that as a young man, he has experienced taking part in the Peñafrancia festival, which is celebrated on the third Saturday of September in Naga City. "First time ko makapunta sa festival when I was in my mid-twenties. Sumasama ako as procession as a spectator," he said. One part of the movie shows how a silver dome is paraded in the streets while hundreds of devotees aim to get near the Virgin of Peñafrancia, affectionately called Ina by Bicolanos. Jomari says of the dome, "It's made of steel, binubuhat yun, medyo mabigat. It's for protection kasi may mga deboto na masyadong aggressive. Inaabot talaga nila and they try to get a hold of the Virgin. "Color-coded yung [mga tao]. Pag naka-itim, sila ang mga nagbabantay sa kanya. Pag naka-brown or puti, mga pari yun. Ganun din pag nasa barge [sa fluvial procession]. Bawal ang babae sa barge kasi pamahiin nila," he explained. Aside from starring in Ikaw ang Pag-ibig, Jomari is also part of ABS-CBN's fantaserye Imortal. FOCUSING ON OPM. Jomari, co-owner of Fearless Productions, reveals, "Hindi sa amin ang mga upcoming concerts ngayon, pero we're still negotiating for new artists by mid-year. "Actually, ang gusto namin mag-focus sa local artists. We're planning on doing something bigger than the usual pero OPM." Ogie Alcasid, president of Organisasyon ng Pilipinong Mang-aawit (OPM), said in a previous interview that they plan to push for higher taxes for foreign acts. The newly wed singer also hopes that the amusement tax of local artists for their concerts be waived. When PEP asked for his reaction to this proposal, Jomari said, "Siyempre, dadaan 'yan sa Kamara [House of Representatives] and sa mga lawmakers. Kung ano ang ipatutupad na batas, kami naman as producers, susunod lang kami. We will abide. "Hindi naman kami kokontra. May point rin naman ang OPM. Siyempre sila ang eksperto pagdating sa ganyan at sila ang nakakaalam talaga ng totoong nangyayari. "Kung kailangan dagdagan ang buwis ng foreign acts, kailangang sundin. Kung babawasan ang buwis ng OPM, kung makakabuti sa industriya, kailangan sundin."